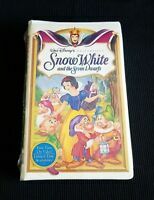 Aladdin Walt Disney Black Diamond VHS. RARE! RARE!!! Disney Masterpiece Bambi 55th Anniversary Limited Edition VHS SEALED!! Belle (voice of Paige O'Hara) is the most beautiful girl in a provincial town in France. Unfortunately for those who might want her as a wife, including the dim, narcissistic Gaston (Richard White), she's also one of the village's oddest denizens. She keeps to herself, helping her inventor father, Maurice (Rex Everhart), with his contraptions, and, in her spare time, devouring books. She has read just about everything available in the town, and eagerly awaits the arrival of anything new. Every time she ventures outdoors, she draws stares and snickers, but, despite her strangeness, Gaston is determined to marry her. Then, one fateful day, her father disappears in the forest. Belle goes searching for him and stumbles upon a dark and scary castle. Venturing inside, she discovers a gallery of magical creatures – regular household objects that speak and move. There's Lumiere (Jerry Orbach), a candlestick with impeccable manners and an voice that recalls Maurice Chevalier; Cogsworth (David Ogden Stiers), a clock with a high impression of himself and his role in the castle; Mrs. Potts (Angela Lansbury), a grandmotherly tea pot; and many others. Then there's the Beast (Robby Benson), the terrifying creature who rules over this domain and holds Maurice captive. Once a handsome prince, he has been cursed to remain a beast until he finds someone who truly loves him in spite of his appearance. Now, he is filled with equal parts hope and dread at Belle's arrival -- hope that she might be "the one" to break the spell, and dread that she might be repulsed by his ugliness. Nevertheless, he agrees to release her father if she accedes to being his permanent guest. She makes the bargain, Maurice is set free, and she is trapped. In time, however, Belle discovers that life in the castle is not as dreadful as it initially seems. One of the top Disney films of all-time, and one of the best films period, Beauty And The Beast is a blend of fairy tale and music the entire family can enjoy together. In all it is one of the greatest love stories ever told. "Irresistible" is an apt description of this film, because every frame is imbued with a magic that is rare for any motion picture, animated or otherwise. Beauty and the Beast is a triumph of artistry – a rare movie where all of the elements gel perfectly. I gave my great niece a "Beauty and the Beast" tea party set (plastic dishes and a big plastic teapot that holds the dishes) for her third birthday. She enjoyed playing tea party so I ordered the video to see how the teapot fit into the story. My three year old great niece thought the beast was sort of scary (all the growling, anger, breaking things). Gaston was a putz. Mrs. Potts, on the other hand, was sweet and caring and a most congenial hostess for the castle, as was Belle. And it was a treat to hear the late Jerry Orbach as Luminere. Exactly what I would expect from a Disney movie! This movie is exactly what I would expect from Disney- quality animation, great music, it reflects somewhat traditional values, it contains a moral that is easy for even the youngest of children to understand AND it manages to entertain the adults in the audience, as well as the children (without adding anything too inappropriate for the children). I also like that the heroine, Belle, is portrayed as somewhat of an intellectual and that she demonstrates much respect for her father (even though many of the townsfolk think he is a crackpot). However, be aware that it does contain several rather intense scenes that could be scary for the younger ones. I would recommend screening first if your child is at all sensitive. In his foolish youth a handsome prince turns away a beautiful enchantress disguised as a hag because of her appearance. To teach him a lesson- that true beauty lies within- she places a curse over him turning him into a "beast" that can only be lifted when he learns the true meaning of love and is able to earn the love of another despite his "beastly" appearance. I've always enjoyed these Disney movies as a child and still do today with my kids. The black diamond classics can't be beat!